The airline known for its mood lighting reveals its first mobile app for iOS and Android. Mobile apps have made air travel a little bit more tolerable, but for a while one of the most-loved airlines had a noticeably missing mobile component. Well, not anymore: Virgin America’s app has finally arrived, and it looks like it was worth the wait. 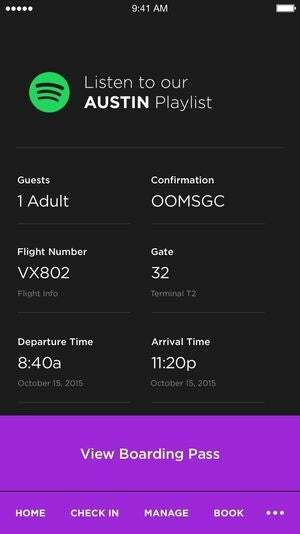 On Thursday, Virgin America revealed its first mobile app for iOS and Android, still in beta. Like most other airline apps, it combines flight-booking and checking-in capabilities but with a more streamlined experience and that cheeky Virgin America flair. According to Virgin America, it can take just 60 seconds to book a flight using its brand-new app, and that even includes the time it takes to choose a seat. The airline has also partnered with Spotify so that after you check-in you can stream a playlist inspired by your destination. You will need to have the Spotify app installed to stream these playlists, however, which include “Mile High” (yes, that type of “high”) if you’re flying to Denver and “A Night on Broadway” if you’re flying to New York City. It’s the first airline app to offer this “soundtrack for your trip” feature. This integration builds on Virgin America and Spotify’s original partnership last year of curating over 70 public city-inspired playlists. Non-premium Spotify users that launch a playlist via the Virgin America app will still listen to ads, however, and they won’t be able to select songs on-demand, as that is a feature reserved for paying subscribers. “We wanted an app that’s enjoyable to use, makes the booking process simple, intuitive and fast, and gets guests excited about their travel journey, which is why we partnered with Spotify to offer the first ever soundtrack for an airline app,” said Virgin America CMO Luanne Calvert in a press statement. In addition to helping you book a flight, check in, and rock out at 35,000 feet, the new Virgin America app sends you real-time notifications about your flight status and personalized deals based on your favorite travel destinations. You can also store other preferences, like your default credit information, your go-to cabin class (for those of you who only fly first class), and whether you prefer a window or aisle seat. For iPhone users, the Virgin America app lets you save your boarding pass to your Wallet, but it does not support Apple Pay for booking a flight or purchasing extras. In 2015, Delta Airlines launched Apple Pay support in its Fly Delta app, becoming the first U.S. airline to allow travelers to book flights using Apple Pay. 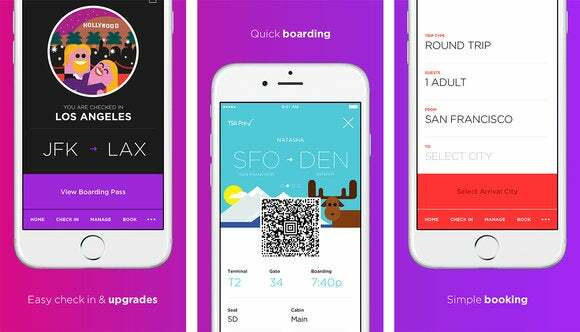 Virgin America’s new app was co-designed from scratch by the Virgin America team and Work & Co., the digital design firm that also had a hand in creating the company’s website. In 2015, VirginAmerica.com was awarded “Best Visual Design Site” and “Best Responsive Design Site” in the Webby Awards. The Virgin America app takes some design cues from the website, including the cheeky avatars and the bold fonts. 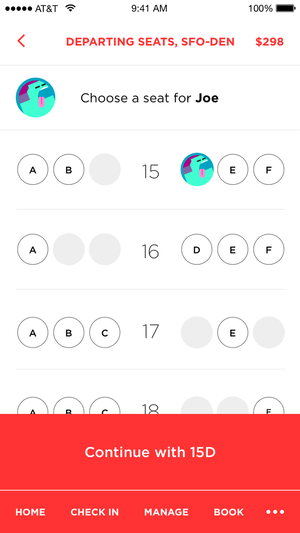 You can sign up to try the new Virgin America app in beta by heading here. Why this matters: Airline apps have mostly aimed at being super-functional, but Virgin America is taking a different approach. By integrating Spotify, the Virgin America app follows the rest of the mobile world in merging services. Maybe when the app gets its official release later this summer, it will incorporate other popular apps. Can you imagine being able to Tinder swipe but only from a group of people also flying Virgin? Or only passengers on your flight? Or only the ones flying first class? It’s a logical next step after Virgin America introduced being able to chat and buy drinks for fellow passengers from your seat.